Finca Vista-Sol is on a hillside with scenic view of Ariany village. You have exclusive use of 200 m terrace, 130 sq.m. lawn and the 10 x 5 m pool with Roman steps in the well-maintained surroundings. This detached house was completely renovated this year and is comfortably furnished. Bathroom and kitchen are fully equipped. One bedroom has a double bed, the other two single beds which can be joined up. The cozy living room contains a large fireplace and satellite TV including international channels. All rooms on one floor. The living/dining room and kitchen are at the front of the house, whilst the two bedrooms are at the back, with the bathroom including bath in between. This little rustic idyll is surrounded by greenery, but only 15 min to the beaches in the bay of Alcudia and only 5 min to the shops. All rooms on one floor - no stairs. The upper terrace is not in use and the adjacent room is a store room used for extra air cooling on hot or cold days. Lovely location. Peaceful and private. Need to hire a car but we walked into town for supplies. Great property in a beautiful quiet location. Well equipped with all you need. Pool and gardens amazing...Orange and lemon trees in front of property and fields all around. Had a really lovely relaxing holiday...Will definitely be back. Only downside is that there was only one British tv channel we could watch...but no complaints about anything else. Das Angebot mit Hilfe der Klimaanlage zu Heizen ist, bei einem Preis von 10.00 €/Tag wohl nicht wirklich ernst gemeint. Wir hatten einen sehr schönen Urlaub. Die gesamte Anlage - Haus, Pool und Garten - war sehr sauber und gepflegt. Es ist alles so wie beschrieben bzw. auf den Fotos zu sehen. Wir würden auf jeden Fall wieder dort Urlaub machen. Don´t hesitate! It´s a wonderful place. Me and my husband with two sons (11 and 14) spent a week here and it´s a true paradise. The pool is amazing and our sons lived in it. I mostly enjoyed the fact that you are really on your own and the view over the valley is better than any ocean view. You do need a car and the ocean is approx 25 min away but that was no problem. The feeling of "coming home" when the carport is opening is amazing. It´s a small house but has everything you need and is clean and fresh. Opening those double doors in the morning, taking a dip in the pool while watching the palm trees and then sneak out to the orange trees and get one for breakfast....priceless. We will come back! die Abwicklung lief hervorragend, das Haus konnte direkt bezogen werden und es war in einem sauberen und einwandfreien Zustand. Alles hat funktioniert, der Pool war ebenfalls top sauber, die ganze Anlage sehr gepflegt und schön. Die Unterkunft kann in diesem Zustand ohne jeglichen Zweifel weiter empfohlen werden. 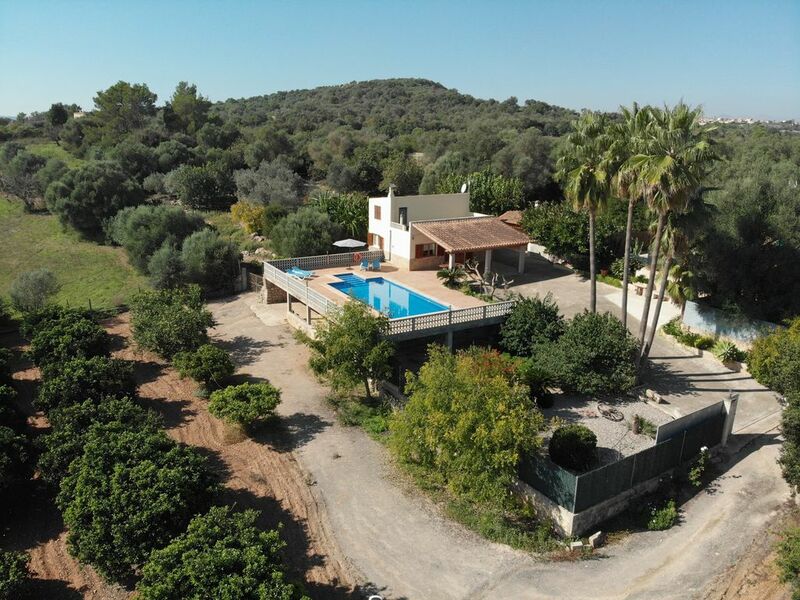 Sehr ruhig gelegene Finca mit super Pool. Wir waren das erste mal im Oktober auf Mallorca. Die Finca haben wir aufgrund des Pools und des Preises gebucht. Alles war genau wie beschrieben und auf den Bildern zu sehen. Die Übergabe war auch reibungslos und als wir noch eine Zudecke benötigten, wurde diese sofort geliefert. Man ist wirklich völlig für sich und in dem großen Pool kann man schön seine Bahnen ziehen. Auch wenn er im Oktober recht kühl ist. Von hier aus ist man recht schnell an den schönen Strand von Alcudia gefahren. Diese Finca ist zu empfehlen. Wir freuen uns sehr, dass Sie sich so wohl gefühlt haben und danken Ihnen für die positive Bewertung. Gerne begrüßen wir Sie wieder. Herzliche Grüße und alles Gute wünscht Ihnen Lina und Familie sowie das gesamte Immobilien-Sineu-Team. There is plenty of rest and relaxation on offer in the tiny, unspoilt village of Ariany. Take a look at the beautiful village church with its unusually attractive Mediterranean garden. The nearby restaurant Ses Torres is well-known for its Mallorcan specialties on the lunch menu. The marvellous transport system connecting the surrounding villages and the upper coastal area - reachable in 15 min - makes Ariany ideal for any kind of day trip. And in 10 min you can be in Manacor, the second largest town on the island, where there are lots of shops, doctors, a modern hospital and lots of things to see. Manacor is well-known for olive wood carvings and mallorca pearls. It's only 5 min to the railway station in Petra village for a comfortable train to Palma.